Chia seeds pack a mighty punch when it comes to nutrition, packing more calcium than milk, more antioxidants than blueberries and more omega-3 than Salmon. Chia seeds are also packed with fiber, protein, antioxidants and phytochemicals. Now that’s what I call a superfood! The high amounts of dietary fibre in these chia seed puddings helps with appetite control, bowel movements, and blood sugar levels, all of which can assist weight loss. 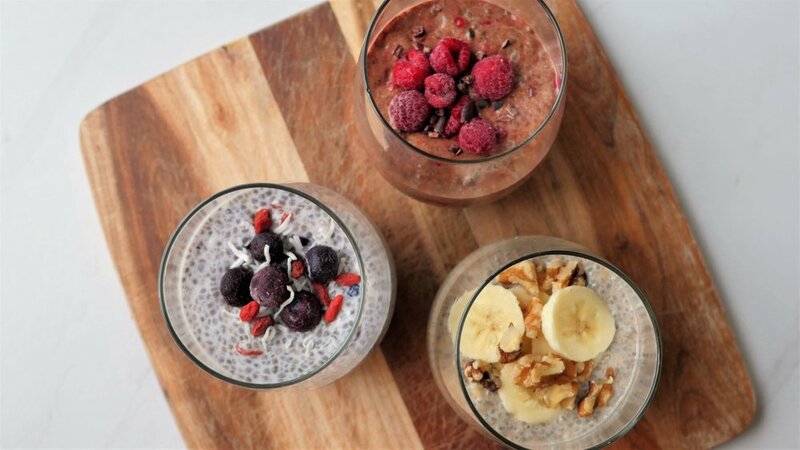 Chia seed pudding is a simple and delicious way to easily get all the wonderful benefits of chia seeds. They take minutes to make and have enough protein and nutrients to be a quick, on-the-go breakfast, healthy snack or even dessert! You can’t go wrong! Place chia seeds and milk in a jar or bowl and mix well until combined. Cover and place in the refrigerator for 4 hours (until it forms a pudding-like texture) or overnight. When ready to eat, stir through sweetener of choice (if using), spices, cacao powder, cacao nibs, berries, mashed banana (depending on your chosen flavour). Before serving, garnish with additional toppings (that you stirred through your pudding or coconut yoghurt, sliced banana or additional fruit, nuts, seeds, nut butter). Served chilled and enjoy!